HandMade Marks shows parents how to develop attention, emotional connection and control, speech and literacy in young children using scribbling and drawing. Exercises, developmental benchmarks, evaluation tools, research questions included. 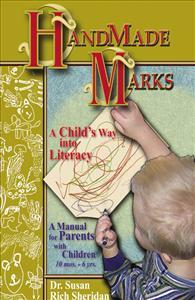 HandMade Marks introduces a brain-based theory of early childhood education with an applied Scribbling/Drawing/Writing program. Benchmarks, evaluation tools, and exercises for parents with children 10 months to 6 years support and encourage sustained attention, emotional control and connection, expanded speech and literacy. While adding fun and closeness to language learning, this program also addresses developmental deficits and delays. Autism, technology and a range of research questions are discussed. Dr. Sheridan has published a companion book, Saving Literacy, for professional caregivers, including teachers and therapists. Dr. Susan Rich Sheridan is a scholar/teacher with degrees in English, Art and Education.